Basic form and functionality make the Liberty 1-3/8 in. White Plastic Round Knob a great addition to laundry, garage and storage rooms. It is available in a durable white finish on a sturdy plastic base material. Uses 8-32 x 1 in. machine screws. Amerock provides a unique assortment of premium quality decorative knobs and pulls, setting the standard for fashion, finish and design innovation. With styles spanning from Traditional to Contemporary to Eclectic, Amerock is sure to meet your design needs. 1-3/8 Plastic Round Knob, 1 per package Basic form and functionality make the Liberty 1-3/8 in. 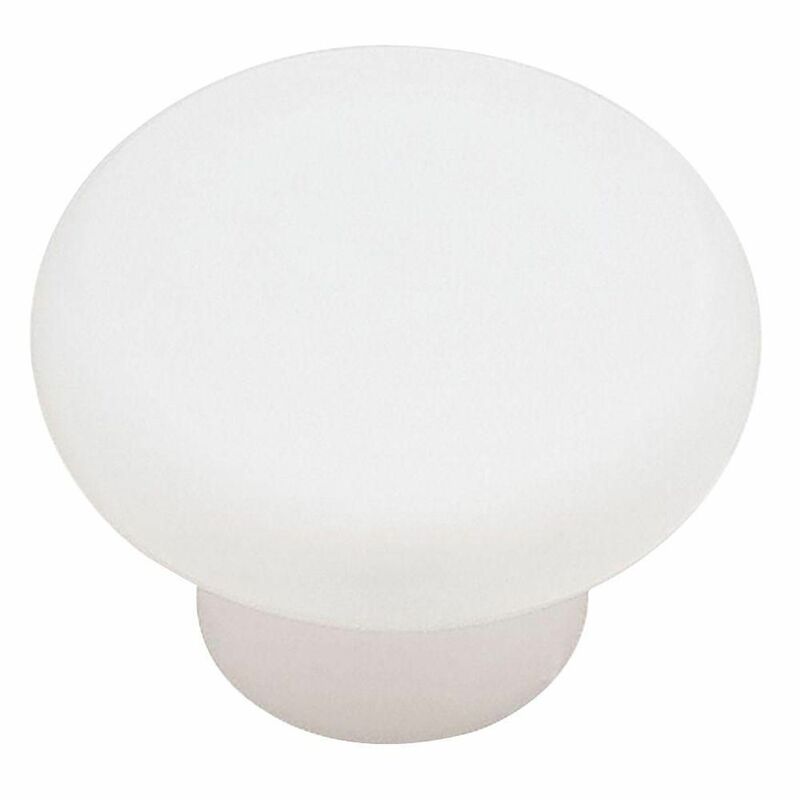 White Plastic Round Knob a great addition to laundry, garage and storage rooms. It is available in a durable white finish on a sturdy plastic base material. Uses 8-32 x 1 in. machine screws. 1-3/8 Plastic Round Knob, 1 per package is rated 3.6 out of 5 by 5. Rated 5 out of 5 by Bushwacker from Just needed one more. I was building cabinets for my house and the local Home Depot came up one drawer pull short. I ordered several on line. Before they arrived, I went back in my local store and the drawer of pulls was refilled. Mine arrived that same day at the house. Postage and all. Rated 5 out of 5 by KayakFisher1967 from Basic knob for a low price I used 2 of these plastic knobs for a project with my kayak that I fish out of. I made a gear basket with a lid and a top box. I used bungee cord to secure the top lid to one box, and another bungee to secure the top box to the main box. Because I mainly fish saltwater, the knobs are plastic and won't rust. They offer a big enough lip that the bungees aren't going to "accidentally" slip off. Great product for a great price. Rated 4 out of 5 by MG2120 from A basic knob Photo and description show and say "round knob". Perhaps I should have searched for ball type round knob. Price was right and they serve the purpose. Knob is flat, but round. Rated 3 out of 5 by LazyOnlineShopper from Average I think the picture of this item gives the impression that this is a close-up shot, rather than the reality that this knob truly is bulky. I am a fan of Liberty and think they make good products. This one is also. It does not feel cheap or flimsy or anything like that, but it IS bulky. I am not doing anything facny with this knob. It is just going on the laundry room cabinet doors, so for the price and intended use, I am satisfied. I gave it a rating of average simply to say - if you are looking for something inexpensive for just a basic need - something average - this will work fine.